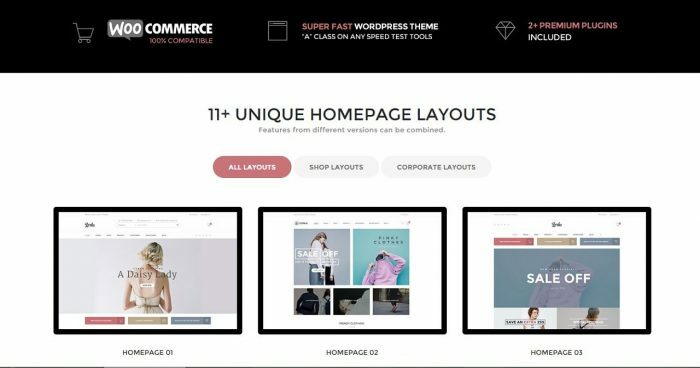 Welcome to the wonderful world of WordPress WooCommerce Themes – The world’s fastest growing e-commerce software for the most popular blogging platform – WordPress. WooCommerce, without a doubt, is one of the most attractive and trusted e-commerce solutions can help you build an online store without spending thousands of dollars on development. WooCommerce exists to help you sell anything. If you need absolute control over your shop, starting with what you sell and how your shop looks all the way through to advanced features & scalability, look no further. No matter what you’re selling or how much you’re selling the possibilities are infinite and endless. With 8,661,556+ downloads WooCommerce (Source: woothemes.com) and continue growing faster, WooCommerce will transform your WordPress website into a thorough-bred eCommerce store. It’s amazing and incredible! So, now is the time to reveal the most important guys in this show! The first guy on our short list is Adot which has been released in June 2019. However, Adot – eCommerce WordPress Theme is foreseen to be one of the best WordPress WooCommerce 2019 soon. Coming with +10 different home pages for selling fashion items or any non-digital products, you can choose any of them to install just in minutes. Interestingly, Adot offers you five blog styles, eight portfolio effects, five header layouts, unlimited footer, unlimited color and layout, sidebar generator to generate as many sidebars as you need. Adot is developed for the best eCommerce WordPress Plugin – WooCommerce. Besides that Revolution Slider, Drag & Drop Page Builder is also integrated into this theme to save your pocket. Mainly, Adot includes WooCommerce Sales Countdown – one of the best WooCommerce Plugins for Marketing 2019 developed by ThimPress itself for sale campaigns which will save you another $16. Last but not least, if the above features could not convince you, I am so sure that you have to think twice because of its excellent professional customer support team. All issues are quickly handled in satisfaction. Believe me, and We could make a bet! Another one comes with us in showcase today is a handcrafted Spa and Beauty WordPress Theme for Spa or Salon Business, wellness center, yoga/meditation classes and all other health care businesses. This theme offers WooCommerce Currency Switcher – is a plugin that allows you to switch to different currencies and get their rates converted in the real-time – a must have a plugin for your WooCommerce powered online store. Of course, Aqua also includes some premium advanced plugins like Revolution Slider, Visual Composer, Contact Form 7 and especially integrated perfectly into your self-hosted WordPress website with WooCommerce – best WordPress eCommerce plugin available for you. Aqua had just released an update a few days ago but this WordPress WooCommerce theme worthy of being one of the newest themes for WordPress WooCommerce in particular and WordPress eCommerce in general. With Aqua, building a super functional WordPress business site completely at your fingertips. The third name of the WooCommerce theme will be introduced a super fast WordPress theme, extremely customizable, fully responsive and suitable for every type of your business, blog, portfolio, and of course, optimize for an eCommerce specifically! 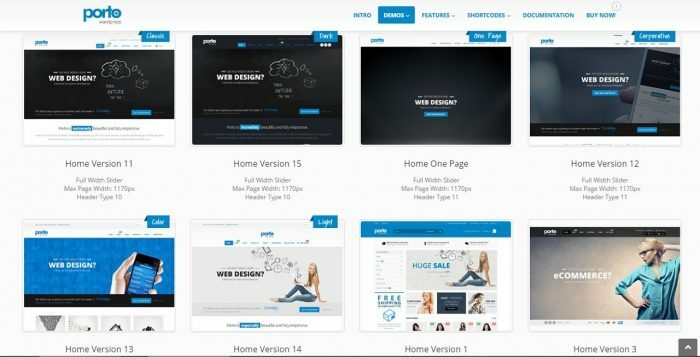 Maybe this guy is exactly what you are looking for if you need a fastest WooCommerce WordPress theme and SEO friendly design to help you build a unique and professional WordPress business site. With 14 unique homepage layouts, six additional designs of the slider area, included Master Slider, Visual Composer and more premium plugins for WooCommerce…, all kinds of things you would expect from the perfect and beautiful WordPress WooCommerce theme right out there! If you have products to sell, you’re already set to because Porto is WooCommerce ready! Moreover, Porto has a huge of amazing features which I can’t mention all here and more and more unique features are surely coming soon in next updated versions! So stay tuned for the latest versions. Note: Before you get started, please be sure always to check out documentation below. This WooCommerce WordPress theme actually deserves its name – Queen is a very gorgeous, graceful and high-resolution. Queen is compatible with an online fashion store has classic style and elegance. She’s also perfect for more different types of online businesses. 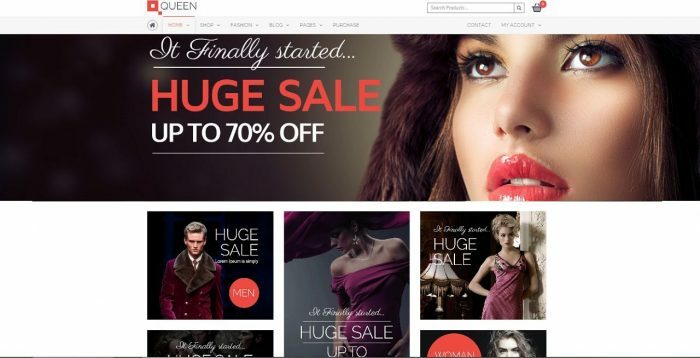 I bet you this beauty queen is one of the best WooCommerce themes with the highest quality of graphics, well designed, fashionable, super functionality, flexibility and contains a lot of great features for your WordPress WooCommerce site.We’ll need a lot of words to describe the beauty of the Queen. However needless to say about all of it here. Are you curious? Let’s make a visit at ThemeForest store to contemplate the Queen of WooCommerce’s world. We’ll need a lot of words to describe the beauty of the Queen. However needless to say about all of it here. Are you curious? Let’s make a visit at ThemeForest store to contemplate the Queen of WooCommerce’s world. The features, customer support, documentation, flexibility, the powerful ability to customize, design/code quality are all A+ rating. If you are selling a small range, large range, or single range product, try this theme out (a customer said that). Everything you need, Wiz has it all! Now it’s time to show the smart WordPress theme became Trending on ThemeForest – Wiz. This is a different eCommerce theme with dozens of unique features. Have you ever seen a WordPress theme includes ten value premium plugins for free? Yeah! This guy will save you 200$ for one package contained in this incredible WordPress theme. With all of the powerful features, Wiz will cover all you need to build a unique and amazing WordPress eCommerce site for any kinds of the website: Cafe, Restaurant, Nutritional, Charity, Accounting, Corporate, Startup, Photographer, Shop. With all of the powerful features, Wiz will cover all you need to build a unique and amazing WordPress eCommerce site for any kinds of the website: Cafe, Restaurant, Nutritional, Charity, Accounting, Corporate, Startup, Photographer, Shop. Another unique feature of Wiz is Smart Skin Generator – First Real Website Color Scheme Generator have ever built. Just select two colors, and the generator will create an excellent custom monochromatic Smart Skin for your site with one click. Of course, one thing can not be missed; this multipurpose WordPress theme fully supports WooCommerce plugin great extra features like Add to Wishlist and Add to Compare. You’ll have a fantastic base to start your store with the beautiful WooCommerce from CommerceGurus. Suave certainly will help you get your business selling online in greatest ways. A smart, sophisticated, multi-purpose eCommerce Theme and fully optimized for WooCommerce, so you have all the tools you need to build an incredible store. Suave has more than 180 sales on ThemeForest for the first month after release. Very impressive, right? One of the remarkable highlights about this guy is the superb customer support. From buying the theme to making the site up and running with demo data, any issue with the theme will be resolved very quickly. And another reason for buying was this super WooCommerce theme is perfectly responsive which you won’t see in many of other eCommerce themes. Bootstrap was well laid out in such a way even the shopping cart page, and the checkout page is perfectly aligned in all mobile and tablets. I’m not going to lie – I’m falling in love with the pretty theme named Suave! I think you will, too! The last theme in my showcase today is an incredible fashion WooCommerce theme. ZORKA is one of the best WordPress WooCommerce themes I’ve seen recently. It comes with very clean and modern hipster design. Zorka is standing for an extremely powerful and flexible premium WordPress theme with responsive & retina ready design, especially perfectly fits trendy fashion website with a strong, sweet and elegant style. In ZORKA you can run great fashion WooCommerce online shops in a couple of hours. This guy perfectly integrated with WooCommerce is an enchanting and easy-to-use Shop WordPress theme that allows you to show your products in a dynamic, so making a fantastic eCommerce site is totally within your reach! ZORKA is perfect for any fashion shops and comes with lots of awesome features, such as: ajax price slider, custom grid modes, revolution slider, quick install package, etc. Also, this eCommerce WordPress theme is SEO optimized and ready to rank your great products! 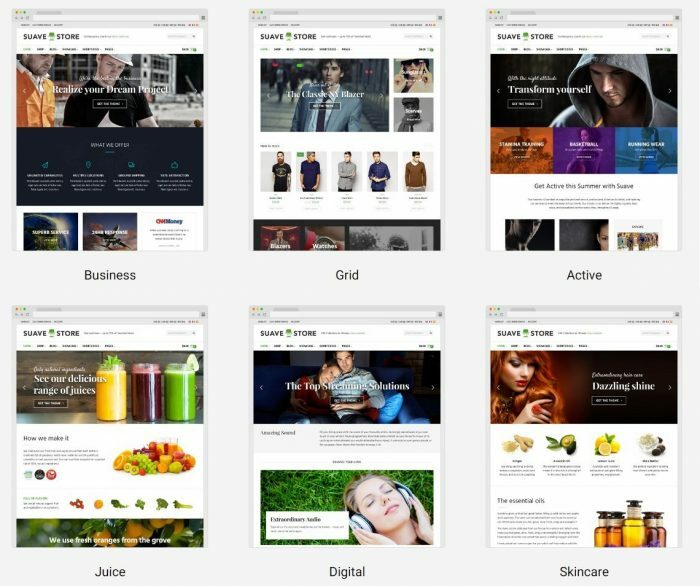 Are you ready to get your WooCommerce theme? If the answer is yes, please check out Online Documentation before purchasing product. WOW! These WordPress WooCommerce themes are so amazing and fantastic. WordPress is the best CMS to create an eCommerce website, and it provides plenty of plugins for the same that users can use. With the effectively supporting of best e-commerce software is WooCommerce, building any kinds of your business become easier than ever. I’ve just put together a list of the top trending WordPress WooCommerce themes 2019 for you here to make getting started a snap. But this list is only just a small selection of the hundreds of WordPress WooCommerce themes available, each of these themes gives a perfect example of how great eCommerce WordPress Theme is in combination with WooCommerce. Go through all of the lists and let me know which one(s) you like the most. And if you’ve got a great live WooCommerce store or theme to show yourself, do not hesitate to share with us in the comments section. If you do build a great experience, customers tell each other about that. Word of mouth is compelling.